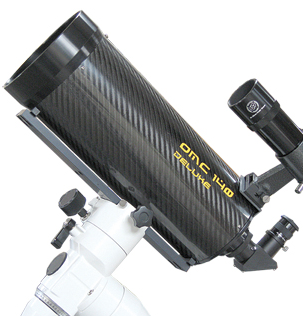 The OMC140 is a modified Maksutov-Cassegrain telescope that, compared to the classical optical design, uses an ellipsoidal primary mirror larger than the front meniscus (in the standard Maksutov-Cassegrain there's a spherical mirror, same diameter of the meniscus) that achieves off-axis superior performance to give you a bigger flat field. Combined with excellent mechanics, everything makes OMC140 a higher quality instrument with incredible versatility. The Maksutov-Cassegrain telescopes are great instruments for people searching for a compact and transportable telescope, that is able to offer maximum performance in photography and observation at high magnifications (like for the Moon and Planets). But usually these telescopes do not offer a large corrected field and therefore they are not well suited for deep-sky observation or photography. OrionOpticsUK has introduced in the OMC a modified optical design based on an ellipsoidal primary mirror larger than the front meniscus (the standard Maksutov-Cassegrain instead uses a spherical mirror with the same diameter of the meniscus) that achieves superior off-axis performance to offer bigger flat field. The OMC140 is offered in two configurations: the Standard model offers mirrors with 1/4PV correction while the Deluxe offers mirrors with 1/6PV correction. 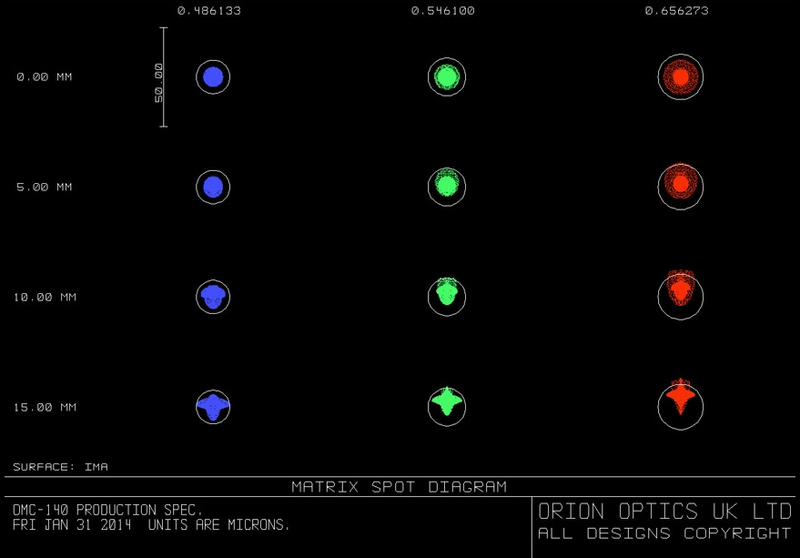 The spot diagrams for the OMC140 is spectacular and this illustrates a 30mm field. The carbon fiber tube of the OMC140 allows at the same time to have a very rigid tube but also lightweight. Furthermore, the carbon fiber has such a low thermal expansion coefficient to ensure OMC140 no change of the focus point. The focuser has a quality internal mechanism that ensures a precise movement of the primary mirror: OrionOpticsUK guarantees that the OMC140 focus shift generates an image shift only a few arc seconds, lower than other telescopes with internal focuser. The focuser is also very smooth and accurate, perfect for focusing images at high magnification.